Rate is based on up to 4 guests. We can accommodate up to 6 guests for $50 additional per person. 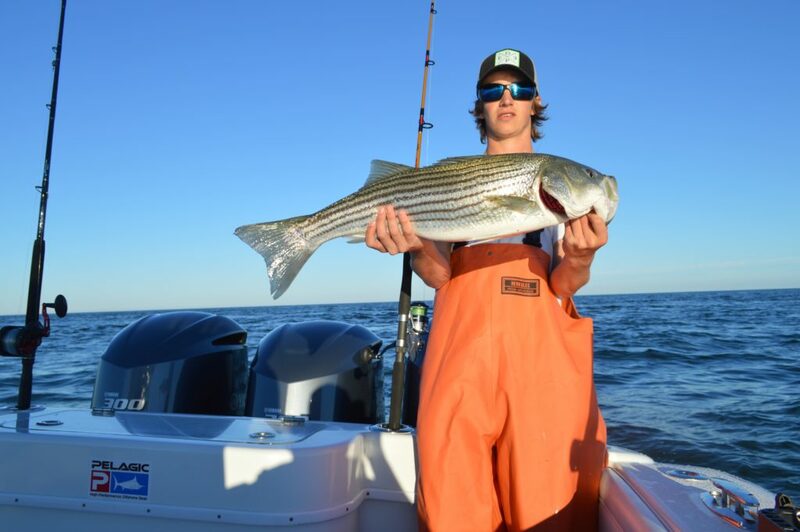 Beginning early June, we target striped bass with top water lures throughout Vineyard Sound. We use trolling and live baiting techniques depending on conditions. 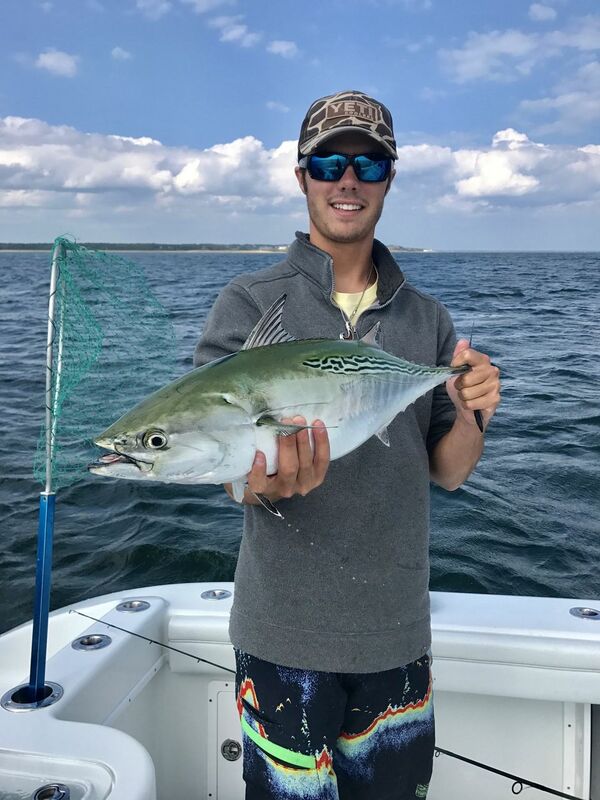 Additionally we run into bluefish, flounder and other seasonal inshore species making these charters fun and full of action! With full charters you have the option to be dropped off on the Vineyard to enjoy lunch and picked back up to resume afternoon fishing. Call for availability before booking. This charter is the most fun when it comes to inshore fishing. We utilize a “run and gun” technique by chasing these small but strong members of the tuna family and casting into busting schools on top of the water. What these fish lack in edibility, they make up for in fight. Sharking is a awesome experience for those of you trying break down the barrier between inshore and offshore fishing. A typical day of shark fishing will consist of traveling 10-20 miles south of Martha’s Vineyard and drifting in 120 feet of water. We will drift Blue Fish fillets from our custom shark rigs provided by JC’s Offshore Tackle, and use all Shimano Tiagra 50 and 80 wide reels, seated on 100% custom made rods. The targeted sharks will be Blue Sharks, Makos, and Threshers. These charters are the mediator between sharking and Canyon fishing. We travel between 25-30 miles south of the Vineyard looking for Bluefin Tuna between 50-150 lbs. these fish are a fun fight on lighter tackle. We also have a chance of encountering White Marlin towards the end of July and through August. We use Tiagra 30 and 50 wide reel, these reels and set on brand new rods I just had built specifically for tuna and marlin fishing south of the Vineyard. This is our premier charter, we travel over 100 miles south of Martha’s Vineyard where we fish for Yellowfin Tuna, Big Eye Tuna, White Marlin, Blue Marlin, Swordfish, and Mahi Mahi. We have all the necessary safety equipment and the highest quality offshore tackle, all provided by JC’s Offshore Tackle, and Skurge of the Sea. Sneakers or boat shoes. Jacket, hat, rain gear, sunscreen and camera. Please bring a cooler with ice for your food and beverage. Jakamo2’s mate does a lot of the dirty work to make the most out of your day. A tip of 15-20% is customary on charters and very much appreciated. You are responsible to to pay replacement value of any rod and reel lost overboard. All fish belong to charter with the exception of Giant Bluefin Tuna which under Federal Regulations require a Federal Permit to posses.